It is with mixed emotion that I stand here to share my thoughts. This is a time of celebration for you – celebrating an anniversary of a beginning for the white man in America. A time of looking back, of reflection. It is with a heavy heart that I look back upon what happened to my People . . . The comment continued to a criticism of the mythology that has grown around Pilgrims, Thanksgiving, and the treatment of American Indians.
. . . History wants us to believe that the Indian was a savage, illiterate, uncivilized animal. A history that was written by an organized, disciplined people, to expose us as an unorganized and undisciplined entity. Two distinctly different cultures met. One thought they must control life; the other believed life was to be enjoyed, because nature decreed it. Let us remember, the Indian is and was just as human as the white man. The Indian feels pain, gets hurt, and becomes defensive, has dreams, bears tragedy and failure, suffers from loneliness, needs to cry as well as laugh. He, too, is often misunderstood. In the place of this speech, James was offered an alternative, written by a public relations person, but he refused to be censored and withdrew from participating in the celebration. 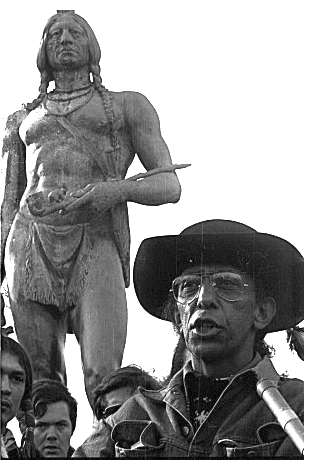 Instead, he led a protest on Cole’s Hill near Plymouth Rock and close to a replica of the Mayflower where stood a statue of the Wampanoag leader Massasoit. The protest included burying Plymouth Rock, boarding the Mayflower to remove the Union Jack flying from its mast, and replacing it with the flag that had flown over liberated Alcatraz Island. Since 1970, Native Americans have gathered on Cole’s Hill on Thanksgiving Day, not to celebrate the Pilgrims’ arrival but to commemorate a National Day of Mourning. The photograph above was taken on November 28, 1996 at the 27th National Day of Mourning. The following year, as protesters and hundreds of their supporters attempted to march through the center of the Town of Plymouth, a confrontation with police lead to violence. Protesters were clubbed and maced. Twenty five were arrested for disorderly conduct and unlawful assembly. Thanksgiving Day is a reminder of the genocide of millions of Native people, the theft of Native lands, and the relentless assault on Native culture. Participants in National Day of Mourning honor Native ancestors and the struggles of Native peoples to survive today. 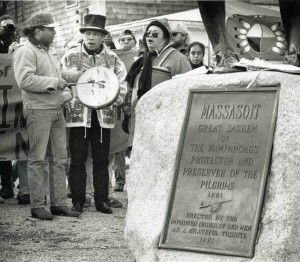 It is a day of remembrance and spiritual connection as well as a protest of the racism and oppression that Native Americans continue to experience. Increasing numbers of people are seeking alternatives to such holidays as Columbus Day and Thanksgiving. They are coming to the conclusion that, if we are ever to achieve some sense of community, we must first face the truth about the history of this country and the toll that history has taken on the lives of millions of Indigenous, Black, Latino, Asian, and poor and working class white people. The myth of Thanksgiving, served up with dollops of European superiority and manifest destiny, just does not work for many people in this country. As Malcolm X once said about the African-American experience in America, “We did not land on Plymouth Rock. Plymouth Rock landed on us.” Exactly. For Frank James’ full 1970 speech, click here. To read more about the 1997 incident, click here for a selection from James W. Baker’s Thanksgiving: The Biography of an American Holiday (University of New Hampshire Press, 2009). The image of Frank James is from Aporia. The image of the 1996 protest is from the Yale Indian Papers Project’s photograph collection.